Buying the best serger sewing machine can be a bit of a tough choice. The first decision you need to make is whether or not you really need a serger! For most people, you can get away without ever touching a serger. This is because your serger can never replace your sewing machine. But if you do a lot of sewing and have many projects lined up for the future as well, then you may be interested in using a serger to speed things up. And boy do they speed things up! This guide will help you through what to look for when buying a serger, including our top picks for the best serger under $300. A serger is a super-fast sewing machine. 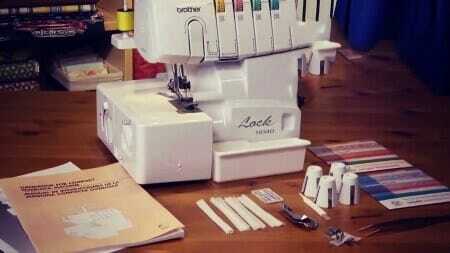 It produces professional looking seams and cuts off the excess fabric while you sew. That is so convenient and time saving! There are a few reasons why you would favor a serger over a traditional sewing machine – especially if you’ve been considering improving your sewing skills. Sergers are a lot faster than sewing machines, completing about twice as many stitches per minute compared with your average sewing machine. If you’ve got a lot of projects lined up, then the serger will help to cut down on the amount of time you spend on each one. The seams are strong due to the use of multiple threads to lock the stitches together. This will give your finished product more durability. The design of the seams is the same as what you will find in most of your clothing. So, if you plan to sell your items at a farmer’s market, then you will definitely need that extra touch of professionalism in your products. Sergers can come with a wide variety of features. As with most items, the more fancy features the product possesses, the more expensive it will be. Think about how much you plan to use your serger and what you plan to use your serger to produce. There’s no point in paying extra for a feature you will never use! To help break things down for you, we’ve included directions to help you pick out the right serger for you. For someone new to serging (or even sewing in general! ), you probably won’t notice the difference between a high end model and a cheaper one. So, if you are new to serging, perhaps buying a top of the line model which includes over 20 different styles of stitches is not such a good investment. You probably won’t use all the features and by the time you’ve developed enough skills to begin using them, it may be time to purchase another serger (depending on the durability of the serger). Sergers are not cheap to come by either. It may even be worthwhile for newbies to learn how to serge by purchasing a second hand model before progressing to buying your own one later on. How many threads can your serger thread through? 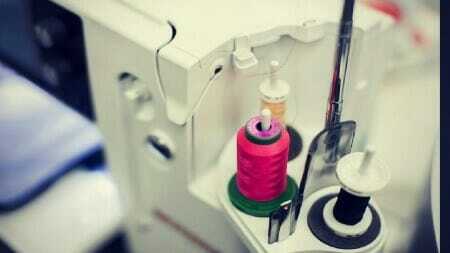 Most sergers will be of the 3/4 variety, which uses 2 needles and 3 or 4 threads. They can’t use 2 or 5 threads. 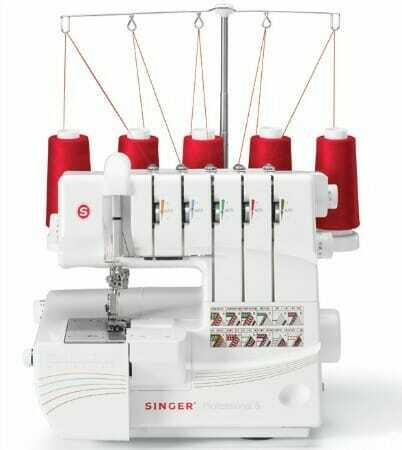 This is the standard for sergers and overlock stitches with 3 or 4 threads are quite durable and should suit most of your needs. 5-thread capability is not as common but it is by no means impossible to find one. These machines are slightly more complicated to thread but will produce a much stronger safety stitch. Also, if you want to produce a cover stitch, you’ll need a machine that has at least 5 threads. So, it’s important to consider what type of serger stitches you want to be producing as the type of machine you buy now will affect what you can produce later. Check what accessories come with your machine. Later on, you might wish you had some accessories that are not currently available for your serger sewing machine. For example, check to see if your serger includes a sewing light. It’s very uncommon to find a serger or sewing machine without a light, but you can’t be too careful. Other people may be interested in finding a serger that includes a waste catcher. This will help to reduce your clean up time of all the excess fabric that has been trimmed off. Or maybe threading is a tough chore and you can’t afford a self-threading serger. 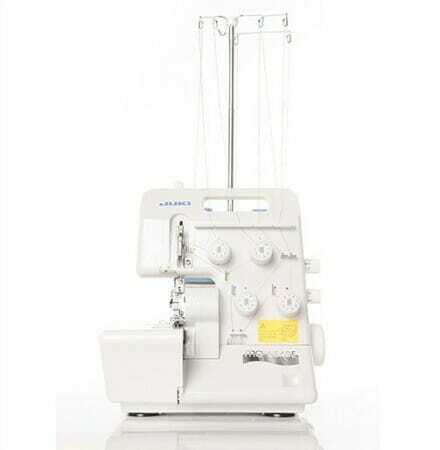 Then looking for a serger which has a big lower looper that’s easy to thread will certainly help. Most modern sergers will already include these features. It’s still always a good idea to double check just to make sure you know what you are purchasing. Almost all sergers will have an adjustable differential feed. It helps to provide an even stitch on different kinds of fabrics, making it a must have if you plan on working with a variety of fabric styles. Differential feed is especially important when you’re working with stretchy fabrics such as spandex. It prevents your fabrics from stretching while you’re sewing. Another cool thing you can do with differential feed is to make ruffles as a decorative design. You don’t have to adjust the stitch length and width for every sewing project. But you will find that certain stitch lengths can have a real impact depending on the type of fabric you’re using. The shorter the stitch length, the more stitches you will have in a greater area and thus you will have a much tighter seam. Tight stitching works well with delicate fabrics and also in helping keep the corners of your fabric smooth. If you have a longer stitch length, the seam will be looser. This allows for more stretch in your fabric. Being able to adjust the tension in the threads gives you a high level of control when you are serging. Most machines will require you to manually adjust the tension by turning the dials on your serger. This may take some time before you get a balanced stitch but once you’ve found the right settings, you won’t need to make many adjustments afterwards. Other serger machines will automatically adjust the tension for you! The serger will detect the type of fabric and will adjust the tension accordingly. Almost all of the time the automatically adjusted tension will work fine for your fabric. But if you’re doing some decorative serging, then it may be a bit difficult for the machine to find the correct tension settings for you. Stitching along at 1300 stitches per minute, it can be difficult at times to keep up with your serger. 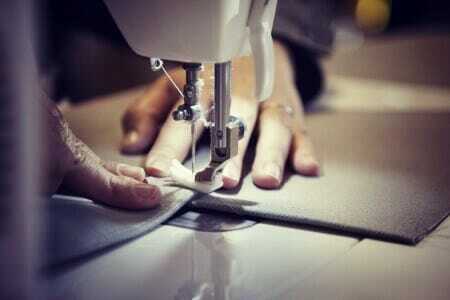 Sewing machines typically manage around 600 stitches per minute. 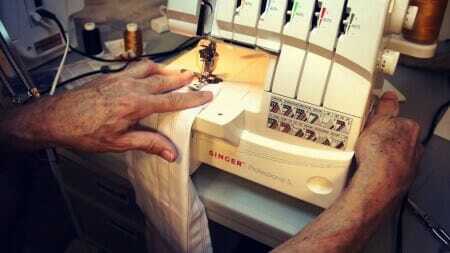 Some sergers have adjustable sewing speed built into the pedal, allowing your foot to control how fast you serge. This works kind of like the accelerator on your car; push the pedal all the way down for maximum speed, tap lightly for a slower and more leisurely pace. Adjustable sewing speed is great because it allows you time to take a break and plan out your next step. It also makes serging less intimidating for newcomers. We understand that threading a serger can be difficult, especially if you have poor eyesight. Auto-threading is available on some machines but it can be very expensive. Just thread the first bit through and puffs of air will push the thread into the right place for you. If auto-threading isn’t something you want to splash out on, then a serger which contains a lovely color coded thread guide (preferably attached onto your serger somewhere) will be helpful in teaching you how to thread your serger properly. What can be more frustrating than buying a perfectly well functioning serger and not being able to use it because the instruction manual is too vague or difficult to understand? Make sure you are able to understand the instructions that come with the serger. If you happen to have a popular model of serger, you may even be able to find tutorial videos online if you’re stuck. Sergers are expensive little machines so we have sorted our recommendations for the best sergers into price categories. Here is our recommendation for the best sergers on the market for the money. 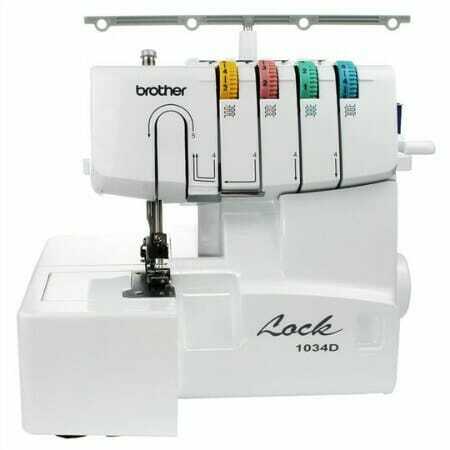 The Brother 1034D serge sewing machine is 3 or 4 tread serger threads which is able to produce a variety of different overlocking stitches. There are many amazing features which makes the Brother 1034D serger our top pick for best serger for your money. You will be excited to learn that the Brother 1034D serger is extremely easy to thread. Not because it threads itself but because the instructions are so detailed. Yes, you will make a few mistakes the first couple of times you try. All you need is a little patience and to take a good look at the instructions. The built in guide tells you the exact places each of the 4 threads needs to go. The threading instructions are located clearly on your serger, with an easy to follow color coded, lay-in threading. The last part is up to you to follow the instructions carefully. Make sure that you thread all the needles in the correct order, otherwise it will cause you a lot of grief later on. 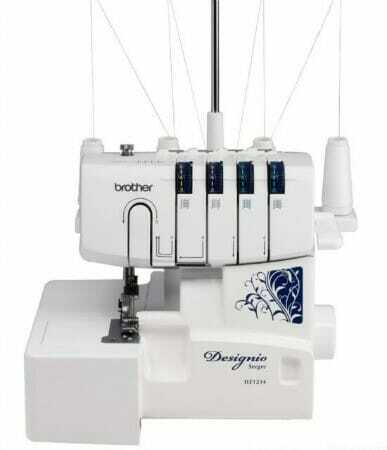 The Brother 1034D serger also comes with an adjustable differential feed setting so that you can work with stretchy fabrics without stretching the fabric while you sew. A great thing unique to this serger is that the blade that cuts the fabric is retractable. So, if you do not wish to trim your fabric while you sew, just tuck the blade away and continue like normal. 22 built in serger stitches will give you plenty of variety and time to play around. The versatility in serger stitch options allows you to create a number of different products with unique finishing touches. At a price of around $150, the Brother 1034D serger is a steal. It includes all the basics for a beginner to start learning how to serge. Even if you’re not a beginner, or if you’ve progressed beyond the beginner stage, the versatility in the types of stitches the Brother serger offers ensures you’ll always have something new to learn and practice. Given its amazing value and that the Brother 1034D serger contains all the features necessary for a basic serger, we have decided to rank this as the best serger for your money. Here is our recommendation for the best sergers on the market over 300$. If you’re willing to spend a bit more money, the SINGER 5 thread serger sewing machine is the best serger for over $300. The best thing about the SINGER 5 thread serger is that it uses 5 threads. With 2-3-4-5 thread stitch capability, you can pretty much form any type of serger stitch there is under the sun. You can even make a cover stitch using the SINGER 5 thread serger, which is something most sergers cannot boast. The ability to make a cover stitch means you don’t need a separate machine for it, allowing you to save some space and money in your sewing work area. There are also 4 built-in rolled hems which you can use. Converting to rolled hem mode on your SINGER is easy – just pull the lever and the machine will move the stitch finger into position for you. No fiddling around is necessary with needles and threads. Another bonus of the SINGER 5 thread serger is that it’s easy to thread up. Again, the serger won’t do it automatically for you but the diagram provided is easy to follow and it’s even color coded to further simplify the process for you. Threading aside, adjusting the tension on the needles and threads can be quite difficult to get right. This is especially true if you sew a lot with fabrics of different thicknesses. To help sort this out, SINGER has included automatic tension adjustment. Now you can get a balanced stitch no matter what type of fabric you’re using. The machine will automatically adjust the tension for you so you don’t need to perform a tension test on some scraps every time you start a new project. Speaking of saving time, this serger sewing machine even comes with a waste catcher. Tired of sweeping up all your trimmed fabric at the end of each day? The waste catcher can be attached to your SINGER, keeping your work area clean and your mind uncluttered. All these features for just under $500 makes it a pretty tempting buy if you’re looking for a high quality serging machine. This serger is quite advanced though, so while it is not recommended for beginners, it is definitely still the best serger for intermediate and advanced users. If you’re a beginner starting out with this serger, you can be confident that your serger will be able to accommodate you through your serging journey. The JUKI portable serger comes in at a close second to the SINGER 5 thread serger. With a price tag of around $350 it’s cheaper than our best serger for over $300, but of course there will be some trade-offs. The JUKI portable serger is also an easy serger to thread, coming with a detailed color coded guide. The lower looper, notorious for being the most difficult part to thread, is simplified in the JUKI. Push the white lever, and it will slide the looper out of the way so you can see if it has been threaded correctly. That is sure to save you time rather than the constant squinting and double-checking to make sure you’ve actually threaded the lower looper through. When it comes to cleaning time, the JUKI doesn’t come with a waste catcher so you’ll have to tidy up the excess fabric yourself. However, cleaning the inside of the JUKI is an absolute breeze. There’s no need to take everything apart with a screwdriver as the covers all open up easily for you to get a lint brush in there and do a bit of sweeping. Just remember to close all the covers properly after your clean otherwise the JUKI won’t serge. This is a safety feature that JUKI has added to all their sergers. Being a 2-3-4 thread serger, it does not come with as much serger stitch variety as the SINGER and what’s more, the instruction manual doesn’t include information on how to perform the stitches that the JUKI is capable of. The more limited variety of serger stitches and lack of instructions can be quite frustrating when you’re first learning to serge. You can look up instructions online or purchase a separate manual to overcome this issue. The JUKI is suited for beginners, but once you grow out of the beginner phase, there’s no room for improvement in the JUKI as opposed to the SINGER and so we have decided to rank this serger sewing machine the runner up. And here is our recommendation for the best sergers on the market under 300$. If you’re new to the serging scene, you’re probably not quite ready to invest hundreds (or maybe even thousands) into a serger. Well, for less than $300, the SINGER ProFinish serger will be sure satisfy. 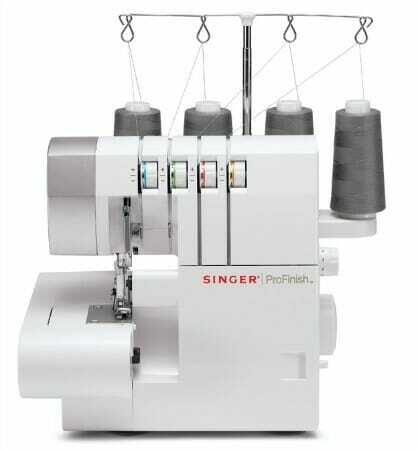 Clearly designed for beginners, the SINGER ProFinish even comes with an instructional video to guide you through the set up and operation phases of using the serger. Threading is also simplified as it is color coded. Also, the ProFinish comes pre-threaded. So, once you take the serger out of the box, you’re all ready to start! Of course, that doesn’t solve the problem of when you want to change the color of the threads. But the beauty of a pre-threaded serger is that you can see first-hand where all the threads go and how it should be threaded correctly, greatly helping in the learning curve. The ProFinish also comes with a free arm that can be removed, allowing you to sew cuffs and pant legs easily. Feeling a bit adventurous? The many accessories which come with the ProFinish, such as the different feet, will be sure to keep you busy as you can now serge with plenty of different effects. Overall, the simplicity and ease of use of the SINGER ProFinish makes it the best serger for under $300. Compact and small, the Brother Designio serger is a great addition for sewing enthusiasts who don’t have quite enough space in their homes. Easy to use color-coded threading guide helps you to thread up your serger and to also keep track of what each type of thread. Another great thing about the Brother Designio serger is that it also uses the same sewing needles as a standard sewing machine. You don’t have to buy special needles for it, just save some money by swapping in the needles from your sewing machine! It’s more difficult to control than most sergers and will take some time for you to adapt to the Brother Designio Serger, so if you’re a beginner to serging or you don’t have much patience, this may not be such a good pick for you. Brother also suggests that the serger not be used in locations that do not support 120V AC, even when you’re using a voltage adapter. For these reasons, the Brother Designio Serger is ranked second for best serger under $300. Whew, that’s a lot of information you need to keep in mind when buying a serger. It may be tough at first, but it’s always important to consider your needs and whether or not your serger can perform all the tasks that you want. You’ll be glad you went to the extra effort. Hopefully, you’ve got a much better idea about the type of serger you are looking for and that it is actually possible to find the best sergers for a cheap price. Have fun serging and may your threads never break!